These ceramic trinket dishes are a part of my spring gift collection with Studio Oh! 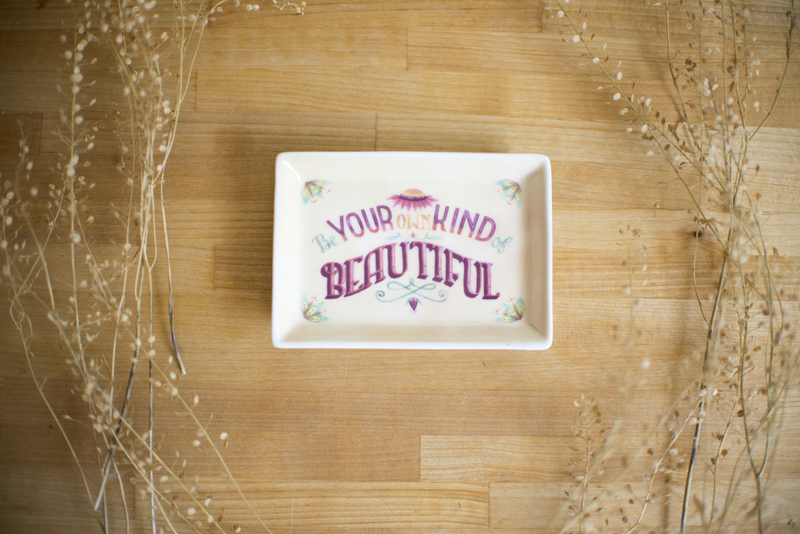 The larger trinket dish, at 6.5" x 4.5", features my Live with Intention art, while the adorably tiny trinket dish, at 4" x 2.75", features my Be Your Own Kind of Beautiful art. The ceramic dishes are sweet little additions of color to any room and the perfect catch-all for a tabletop or desk. You may purchase both the Live with Intention tray and the Be Your Own Kind of Beautiful tray on Amazon or at your local book/gift store that stocks Studio Oh! products. See Studio Oh! 's list of stores their products are for sale here (keeping in mind some stores may not be listed & the stores listed are not guaranteed to sell this particular item).